What are DreamBeams? We experimented with different ways to build a strong accurate lowering beam you can just bolt on. We found the best result for your installation and performance needs was the DreamBeam design. Our exclusive tubular construction is the most accurate lowering beam anywhere. We use thick walled DOM tubing, nested, welded in the fixture giving you full alignment adjustment. The fabricated "I-beam" type parts suffer from "weld creep" as they are welded, which simply means they warp a little. That makes it hard to get consistent finished parts! You only need to remove the factory beams and replace with DreamBeams and you have a 3" drop with the factory coils, full suspension travel and all the goodness that comes with that! Caution - If you try to lower I beam trucks with springs you get trouble, if you heat or cut your springs, even if you use a "lowering" spring you cause alignment issues you just can't correct out! 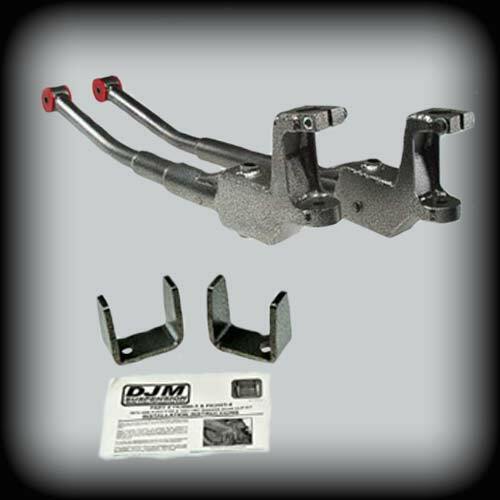 A set of DJM’s Dream Beams for your Ranger which will lower 3″ by simply replacing the original equipment beams! You are ready to get the alignment checked and cruise on down the road. It’s that simple, give it a try! Easy bolt on lowering kit. You want a level stance, good ride and great look!